Do you want to live your life with energy and vitality? 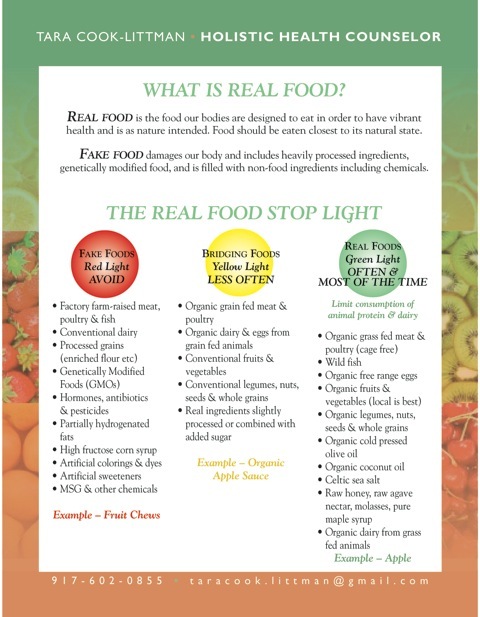 Learn what real food is and how to easily incorporate it into your every day life! Because our lives are busier than ever, processed, packaged and generally unwholesome foods lacking any nutritional value dominate our diet because of the convenience factor. If you are tired, have digestion problems or other chronic health issues and want to feel better, it's time to stop eating out of packages, stop eating food filled with chemicals and other non food ingredients and start eating fresh, real food. I am a REAL MOM living in the REAL WORLD trying to feed my family REAL FOOD. It isn't always easy, but it is very possible. I hope to help you learn what real food is and then how to make real food a part of your every day life. First of all, I want to thank you all for reading my blog and giving me such wonderful feedback. Nothing makes me happier than to know so many of you are now drinking green juice, cooking at home, and trying to avoid GMOs!!! You all motivate me to want to write more. Look for "Real Dinners - Week 2" later this week. I want you all to know about an exciting opportunity to learn about GMOs directly from Jeffrey Smith, who is the leading advocate in this country working tirelessly to require GMO labeling on our food. Jeffrey is coming to Fairfield to speak with a very small group of people. He is amazing and doing such important work. The event is free and there will be some delicious food and drinks. Jeffrey will be speaking about GMOs, the dangers, and what we can do to protect our families, and even if you read my blog last week, "GMOs are Not Real Food", it is no replacement for hearing this man speak. I saw him last year and was blown away. While the event is free, and the most important reason for coming to this event is to be educated, Jeffrey's organization is hoping to raise funds to help them in their important work. For more information on the organization see http://www.responsibletechnology.org/. The hope is that after hearing Jeffrey speak, everyone at the event will feel moved to make a donation in an amount that they are comfortable with. On Friday, March 2nd, I will be accompanying Jeffrey to Hartford where he will speak with Connecticut legislators about a GMO labeling law which was filed today. Go to this link to view the bill. We have a right to know what is in our food. In Europe manufacturers are required to label foods that contain GMOs. Kraft doesn't use GMOs in Europe, but right here in America they still use GMOs because they are not required to label the food as having GMOs. Manufacturers and companies think with their wallets, and if they are required to label foods with GMOs, GMOs will start to disappear from our food because people will not want to buy GMO products (which would become easily identifiable). This is similar to what happened with trans fats. Once trans fats had to be labeled, many food companies stopped using trans fats all together. This could happen with GMOs as well if GMO labeling was required by law. Space is very limited. Don't miss this incredible opportunity to become informed and also to help out a crucial organization. If you are interested in attending this event, please e-mail Glen Colello from Catch A Healthy Habit at catchahealthyhabit@yahoo.com ASAP. Above all else I am a mom of three young children and like to call myself CEO of the corporation Littman, Inc. I am also an attorney and am a former New York City Prosecutor. Most recently I received my certification as a Holistic Health Counselor from The Integrative Institute for Nutrition based in New York City. I currently have a private practice as a Health Counselor guiding clients on a journey to wellness by helping them learn about healthful eating, managing stress levels, feeding their families better and helping them stay active. As a former Prosecutor I am also putting my public speaking and advocacy skills to use by leading seminars and conducting workshops on different topics dealing with health and wellness. I believe in a realistic, step by step approach to living a healthier life within the confines of our modern, busy lives. REAL LIFE DEMOCRACY AT WORK!